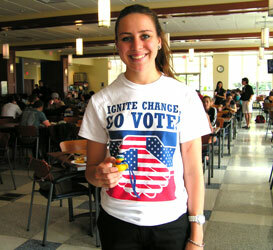 Falvey Memorial Library :: Election News: Student Groups Promote "Ignite Change, Go Vote!" Election News: Student Groups Promote "Ignite Change, Go Vote!" Bridget Kiley with a patriotic rubber duckie. When we asked about the Ignite Change, Go Vote! campaign, members of the Campus Activities Team (CAT), Student Government Association (SGA) and other student organizations obliged us with details. Their answers are summarized below. We also attended one of their planning meetings on Sept. 21 and learned a few facts about voter registration for college students, some of which appear below. How did you come up with the idea for this campaign? Nicki Hornsberry, Student Development director, mentioned it to us over the summer. Bridget Kiley and Francesca (Chessy) Gortzounian, CAT, Chris Marroletti, Student Government Association (SGA) president, and Lael Hoegen, SGA vice president, coordinated the events with members of the Student Nurses’ Association of Pennsylvania (SNAP), Villanova Political Awareness Club (VPAC), Villanova University College Democrats, and Villanova University College Republicans. We wanted to pool our resources, so we met in late August to start the planning process. Bridget and Chessy created the flyers and posters to advertise the events. 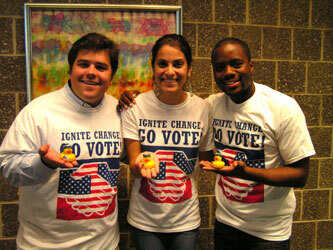 Chris Marroletti, Chessy Gortzounian and Aaron Moore wearing Ignite Change, Go Vote! t-shirts. Who else was involved in planning the events? DeVon Jackson and Siobhan D’Angelo, Student Development, helped to organize training for the volunteers at the voter registration tables. Aaron Moore, SGA, was also a huge help organizing everything. We were also contacted by Rock the Vote and with them we arranged a voter registration tour stop event on Sept. 18. We registered 295 new voters that day! Do you have more events lined up? Yes! Voter registration tables will be set up in the Pit, Spit, and St. Mary’s on Sept. 25, 26 and 27; a “Patriotic Happy Friday” event on Sept. 28; Voter Sticker Pick-up on Oct. 25, 26 and 27, and then free voting-day shuttles to the local polling locations on Nov. 6. What are some of key facts that new Villanova University student voters need to know? Students can register to vote via absentee ballot, but they can also register to vote in the state of Pennsylvania, even if they had previously registered to vote in another state. Actual voting requires a photo ID, and students may use a driver’s license, state identification card, or college ID with expiration sticker. The Wildcard office will issue expiration date stickers to Villanova University students who have registered to vote. The stickers will be distributed on Oct. 25, 26 and 27. The Campus Activities Team (CAT) organizes student events throughout the academic year. These events are held in Dougherty 108, across from the Wildcard Office.